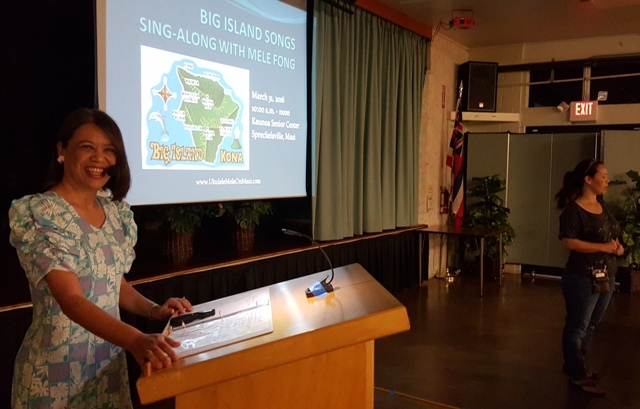 Twenty-three people signed up for my NEW Island Sing-Along Series on Thursday, March 31 from 10:00 a.m. – noon at Kaunoa Senior Center for adults age 55 and better. The second program of the series was about the Big Island of Hawai’i. I used PowerPoint to project the lyrics and chords for 8 songs up on the screen so everyone could see. The presentation of 48 slides took 1 hour and 20 minutes. As I introduced each song, I told the story behind it in keeping with Hawaiian oral traditions whether the song was Hawaiian or not. For songs in the Hawaiian language, I taught how to pronounce the lyrics and the translation. We all had fun singing while I played my ‘ukulele and my husband accompanied the group on his u-bass. I noticed there were more ‘ukulele players who showed up with their instruments this time. Before the program started as we were practicing songs we knew by heart, some of my ukulele students arrived early and we invited them to play along, too. Sharing music is a wonderful experience. 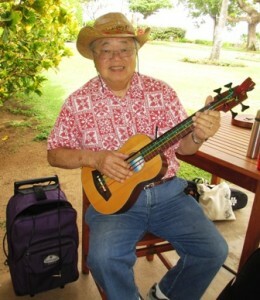 Stay tuned for the next Island Sing-Along Series coming on April 28 about Kauai Island songs. 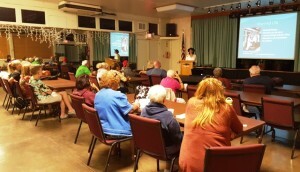 Twenty five people came on Friday, March 11 to my program on Hawai’i’s Prince Kuhio at Kaunoa Senior Center for adults 55 and better. This was the third program in my Hawaiian History Series for 2016. The PowerPoint presentation lasted 80 minutes through 46 slides. The program was in two parts, the first about the Prince and his legacy, and the second a sing-along of compositions during his lifetime. Prince Kuhio lived from 1871-1922. Once again, my husband accompanied the sing-along portion of the program by playing his u-bass. We sang 5 songs including Hawaii Aloha as the traditional song to end the program. For each song I told the story behind the song in keeping with Hawaiian oral history traditions, taught everyone how to pronounce the Hawaiian lyrics, and then led everyone in singing the song twice (once to become familiar with the tune, and then once more to gain confidence). There were a few people who brought their own instruments and played along. Ua Lika No A Like, written by Alice Everett in 1882, tells a love story. Sanoe, written by Lili’uokalani and Elizabeth Achuck in 1800s, tells about a secret love affair in King Kalākaua’s court. On The Beach at Waikiki, written by Henry Kailimai and G.H. Stover in 1915, is a hapa haole song that tells of fun on Oahu. Kaimana Hila, written by Charles E. King in 1916, tells of a journey of friends to Diamond Head on Oahu. Hawaii Aloha, written in the 1800s by Reverend Lorenzo Lyons, tells about the love for the islands. New this time, I noticed a couple of phones being held up as we were learning to sing the Hawaiian songs. Perhaps people were videotaping the lessons for their later enjoyment. After the program, one person came up to say she would like to hire me to review her compositions and give her advice on how to make them better. That’s a first! 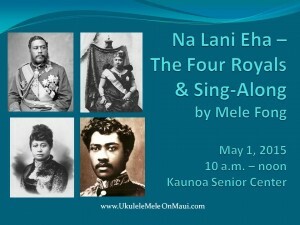 Stay tuned for the next Hawaiian history program in April on Na Lani Eha – The Four Royals. This will be the last of the Hawaiian history series at Kaunoa Senior Center until next year. 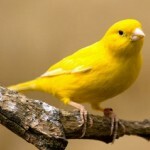 Did you know the song “Yellow Bird” was written as a 19th century Haitian song praising the beauty of a Haitian woman? Here’s the rest of the story. In 1883, Oswald Durand, a Haitian poet, published Choucoune, a poem that praises the beauty of a Haitian woman. This lyrical poem was amongst his most famous works. Durand was said to be “to Haiti what Shakespeare is to England.” Michael Monton, an American-born pianist with a Haitian father and American mother composed music for the poem. He used some French and Caribbean fragments to create his tune, and then published it in 1893. The song Choucoune was first performed in Port-au-Prince on May 14, 1893. It became a popular slow music genre in Haiti called meringue. 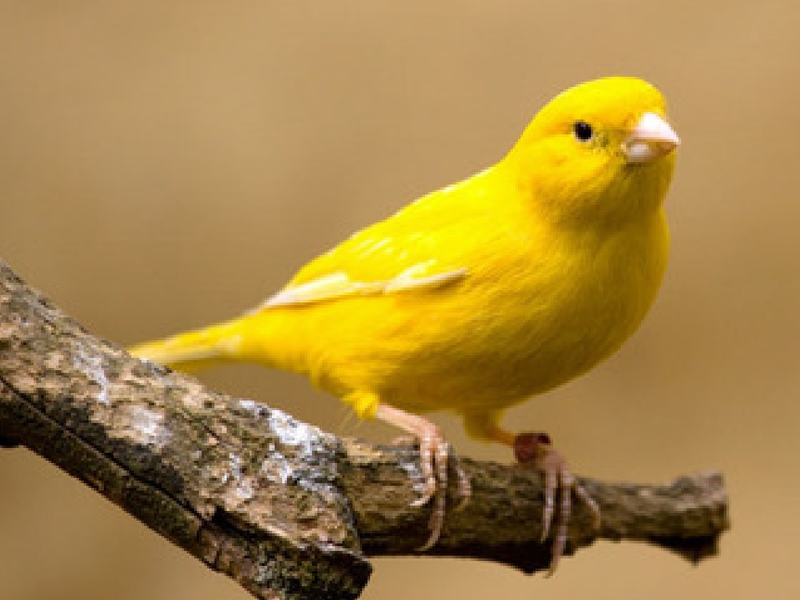 In 1957, the English rending of Choucoune: Yellow Bird, first appeared arranged in the calypso style that became popular in the English-speaking world in the mid-1950s. 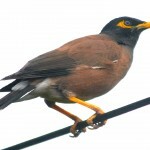 The new English lyrics by Alan and Bergman have no connection with the narrative of the original poem – other than the poem features the words “ti zwazo” meaning little birds, in the refrain. Thus, the original Haitian song is sometimes called Ti Zwazo or Ti Zwezo. In 1961, Hawaii born marimba player Arthur Lyman, also known as the “king of lounge music” released an instrumental version of Yellow Bird that bested a rival released by Lawrence Welk. 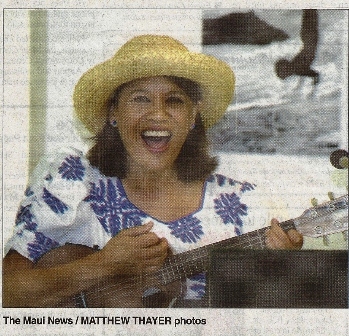 In 2015, along with students in my Advanced Ukulele class at Kaunoa Senior Center for adults 55 and better, we replaced the phrase “yellow bird in a banana tree” with “mynah bird in one mango tree” to give the song a local flavor. Now it’s more fun to play and sing. You can learn how to play my arrangement of Yellow Bird with the Latin Strum for ‘ukulele by subscribing to Complete Monthly Online Lessons. You get to download the song sheets, watch the video lesson of how to play it, listen to and play along with the audio recording, plus watch the video story behind the song. 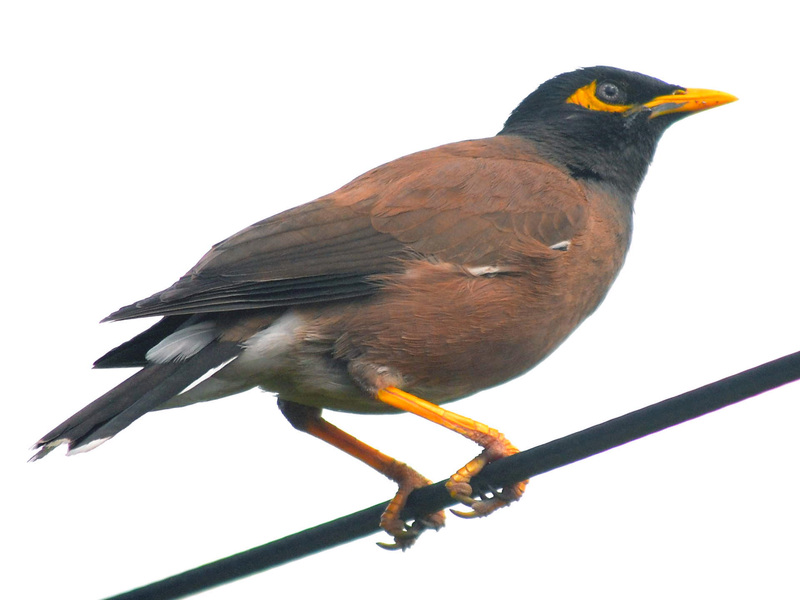 Yellow Bird is Lesson 47 of Complete Monthly Online Lessons. You also get access to over 40 lessons during the 30 day subscription period. Subscribe today! Saturday, September 5. Four Maui residents came to my Queen Lili̒uokalani program as we celebrated her birthday month at the Bailey House Museum. 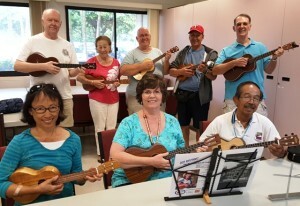 Richard from Pukalani was brand new, and three were returning ̒ukulele students (Ellen, Holly, and Sally) who take classes from me at Kaunoa Senior Center for adults 55 and better. In addition, six visitors who happened to be in the museum also came to the program. Two men stayed for the first half-hour portion about the Queen’s story, and then two sisters and a couple sat in during the sing-along portion. The program lasted 2 hours. When the museum visitors joined the sing-along portion of the program, I made a point of explaining that the Hawaiian language consists of 5 vowels and 7 consonants for a total of 12 letters, and how important it is to pronounce the words correctly with the two diacritical marks (reverse apostrophe is called an ̒okina, and a line over the vowel is called kahakō) because the marks change the meaning of the words. For example, mo̒i means king, and moi means fish. New for this program, I added translations of the original songs according to footnoted references, and explained how I used the most popular verses for my arrangements. For example, the original Queen’s Prayer has five verses, but my arrangement uses only the first verse which is played twice. This completed a full year of my Oral History & Sing-Along Series that began last September at the museum. As planned, the series offered programs on Queen Lili̒uokalani, Prince Kuhio, and King Kamehameha, with the later two programs held on the respective state holidays in March and June. The idea was to offer primarily residents a Hawaiian cultural and educational option on state holidays. However, the low turnout despite advertising in The Maui News, through social media, and on my website has been disappointing. Next year I have committed to continue the Oral History & Sing-Along Series at Kaunoa Senior Center, plus expand with new programs on Island Sing-Along Songs during the snow bird season of January – April. Stay tuned by checking the Event Calendar on my website. 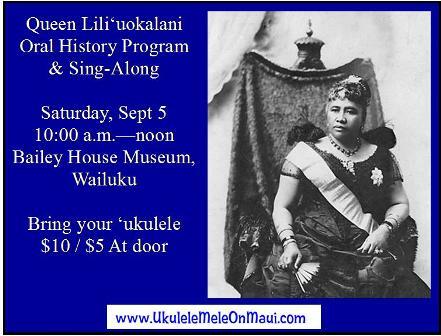 Learn about Hawai’i’s last monarch, Queen Lili’uokalani, and sing some of her songs on Saturday, September 5 from 10:00 a.m. – noon at the Bailey House Museum in Wailuku. This program marks the first year anniversary of the Oral History & Sing-Along Series that began at the museum last September 2014. ‘Ukulele and guitar players are invited to bring instruments to play along as we sing-along to Ukulele Mele arrangements of the Queen’s compositions. Cost at the door is $10 or $5 for members of Maui Historical Society. 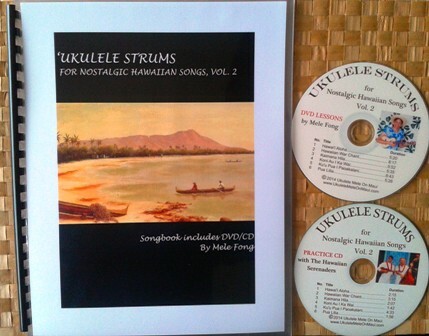 ‘Ukulele players wanting to get ahead of the class can purchase packaged sets of book/DVD/CD for Nostalgic Hawaiian Songs Vol. 1 or Vol. 2 that include some of the Queen’s songs that we will be learning during the program. The packaged sets include the printed song sheets for 6 songs with 8 unique strums, video lessons of how to play the arrangements, and audio recordings to listen to and play along with all in the same key. A few packaged sets will be available for sale at the program on September 5th. ‘Ukulele players preferring to learn online can subscribe to monthly lessons by subscription for 30 days, and then learn some of the Queen’s songs and more. Subscribers can download the song sheets, view the video lesson, listen to and play along to the audio recording, plus watch the video story behind the song in keeping with Hawaiian oral history traditions whether the song is Hawaiian or not. Currently there are 40+ lessons accessible to monthly subscribers. Listen to audio samples of the Hawaiian songs you can learn to play online. Interested in Hawaiian history? See the photo gallery and find out about past and future Oral History & Sing-Along programs. Join us on Saturday, September 5 to learn about Hawaii’s Last Monarch, Queen Lili’uokalani, as we honor her during her birthday month. Twenty-seven people signed up for my last of the Lunch and Learn Presents: Oral History and Sing-Along Series for the year at Kaunoa Senior Center for adults 55 and better. It was nice to recognize some people who had come to every one of my four programs this year, and to recognize former ‘ukulele students. There seemed to be mostly local residents in the audience, rather than mostly visitors now that snow bird season is over and people have returned to the mainland. 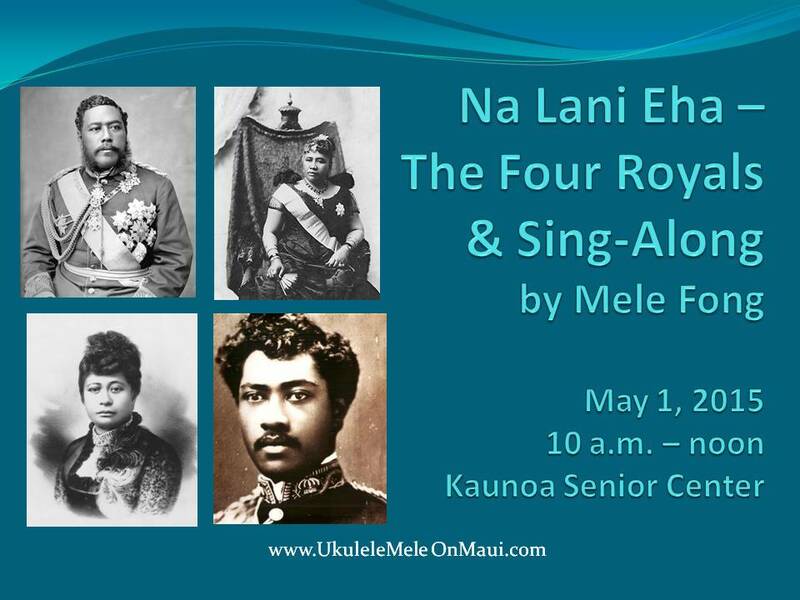 The program for Friday, May 1st was “Na Lani Eha – The Four Royals” and focused on learning about royal siblings King David Kalākaua, Queen Lili‘uokalani, Princess Miriam Likelike, and Prince William Pitt Leleiohōku. It was their musical abilities and patronage of Hawai’i’s musical culture during the last half of the 1800’s that continues to live on today. In May 1994, the non-profit membership corporation called the Hawaiian Music Hall of Fame was founded to “promote, preserve, and perpetuate Hawaiian music and hula by celebrating the achievements of significant individuals and groups.” As such, the royal composers are noted patrons of the Hawaiian Music Hall of Fame. Were it not for their cultural leadership and personal contributions in encouraging and supporting aspiring composers, singers, instrumentalists, dancers, chanters, and poets, Hawaii’s significant musical contributions to the world might not have happened. Part 1 took me about 30-minutes to tell the story of the Four Royals with 23 PowerPoint slides. 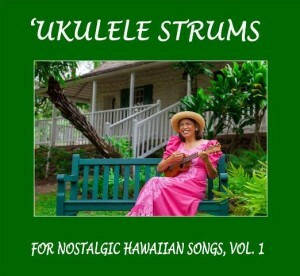 Ukulele players can also learn how to play my arrangements to some of the traditional Hawaiian songs above in my Nostalgic Hawaiian Songs, Vol. 1 and Vol. 2 packaged book/DVD/CD, and/or by subscribing to monthly online lessons. I give more detailed video stories behind the songs in keeping with Hawaiian oral history traditions as part of monthly online lessons. I also told everyone about my plans for next year to offer the Oral History and Sing-Along Series at Kaunoa Senior Center from January – April, and also add a Sing-Along Songs of the Islands Series through May. For example, I may offer Maui island songs in January, Hawaii island songs in February, Kauai songs in March, Oahu songs in April, and then hapa haole boat days songs in May. I’m always trying to come up with new programs to meet what people want, in this case, answering the demand for more Hawaiian cultural programs during snow bird season. Check my Event Calendar for what’s happening. Save the date for Thursday, June 11 for the next Oral History & Sing-Along Series program on “Hawai‘i’s First King.” The program will be held on the king’s birthday, Kamehameha Day, from 10:00 a.m. – noon at the Bailey House Museum in Wailuku. Admission at the door is $5 for members and $10 for non members of Maui Historical Society. Kamehameha Day is one of only two state holidays dedicated to Hawai’i’s royalty. Kamehameha united the islands into one kingdom in 1810, and named them the Hawaiian Islands. We’ll learn about King Kamehameha the Great and take a virtual tour of some the places you can visit today related to him. 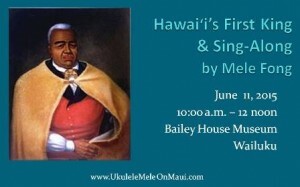 We’ll also sing some the songs that were popular during the 1800’s and beyond, learn the story behind the songs, and how to pronounce the Hawaiian words. ‘Ukulele and guitar students are welcome to bring their instruments to play along (but I won’t be teaching how to play my arrangements). Hawai‘i Pono‘i – Hawai’i’s state anthem. Nā Ali‘i – includes two saying from departed chiefs. Hawai‘i Aloha – hymn to close events. 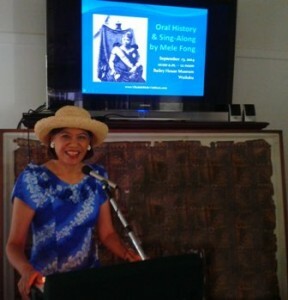 “Hawai‘i’s First King” is the third program in my Oral History & Sing-Along Series held at the Bailey House Museum. The idea that I presented to the Executive Director of the museum is to give residents especially an alternative of something to do on state holidays where they can learn something about Hawaiian history and have fun. The fact remains, how many people know the significance of King Kamehameha and Prince Kuhio? 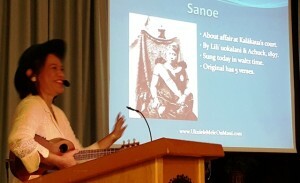 Last September 2014, I began the history series at the museum with a program on Hawai‘i’s Last Queen, Lili‘uokalani during her birthday month. I gave the second program about Prince Kuhio on his birthday, Hawai‘i’s state holiday on March 26, 2015. The circle will be completed on September 12, 2015, when I start the history series again with a program on Hawai‘i’s Last Queen. I enjoy doing research and putting together the PowerPoint presentations to share what I’ve learned about Hawai’i’s royalty. 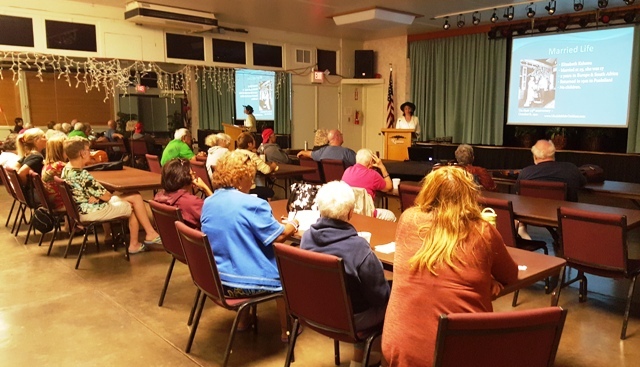 It all started in January 2010, when I began a Hawaiian History Series as part of the Lunch and Learn Program at Kaunoa Senior Center for adults 55 and better. The talks were solely academic for over an hour, followed by optional lunch. Since last year’s success of the new format with sing-along component at the Bailey House Museum, I decided to repeat the same programs at the senior center so I could reach more people. 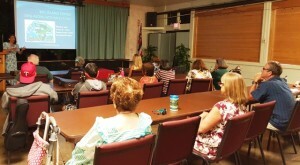 In January 2015, forty-five people attended my program at the center on Hawai‘i’s Last Queen. In February 2015, sixty people attended my program on Hawai‘i’s First King, with a group traveling over 2 hours by bus to get to the center. 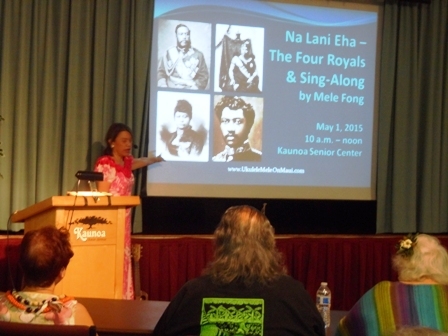 In March 2015, thirty two people attended my program on Prince Kuhio. It is interested to see how the numbers fluctuate with snow bird season (in winter time there are more people in Hawai‘i escaping the harsh weather on the mainland). My next program will be in May 2015 on The Four Royals, and that will complete this year’s history series at the center. What began in 2006 as monthly 5-minute oral history talks to the general membership as historian of the Ahahui Ka’ahumanu Chapter IV Wailuku, Maui, has evolved into hour-plus long PowerPoint presentations and teaching Hawaiian songs to the public in 2015. I enjoy wearing different hats as historian, teacher, and entertainer. Nostalgic Hawaiian Songs, Vol. 2 packaged set of book/DVD/CD is now available for sale on my website. Learn 8 unique ukulele strums to 6 traditional Hawaiian songs. Don’t know how to sing? No problem – we’ll do the singing for you on the audio CD so you can focus on playing your ukulele. Looking for new ways to give life to those old Hawaiian songs? Watch the DVD lessons to learn new strumming patterns for the old songs. 1. Hawai’i Aloha – Morse Code Strum. 2. Hawaiian War Chant – I Wanna Rest/Latin Strums. 3. Kaimana Hila – Olapa Strum. 4. Koni Au I Ka Wai – Hum Ding-Ah Strum. 5. Ku’u Pua I Paoakalani – Pick in 4 Strum. 6. Pua Lilia – (Waltz Strums) Thumb Strum Up/Chicken Pluck. Prefer to learn online rather than by book? Subscribe to monthly online lessons. Keep returning every month for a new lesson, plus have access to the past 30+ lessons with downloadable song sheet, viewable video lesson, audio recording, plus the video story the song for each lesson in keeping with Hawaiian oral history traditions. There are many ways to having fun learning to Watch. Listen. Play. The Ukulele Mele Way. In 1947, the song Rudolph the Red Nosed Reindeer topped the charts and went on to become the second-most successful Christmas song in history after White Christmas. It was based on the 1939 poem Rudolph the Red-Nosed Reindeer written by Robert L. May. His brother-in-law, Johnny Marks, who was Jewish and did not celebrate Christmas, wrote the song in addition to Rockin’ Around the Christmas Tree, A Holly Jolly Christmas, and more. 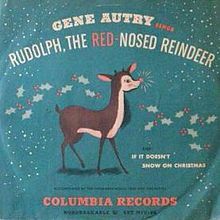 On Sunday, December 6, 1964, NBC first aired a TV special animation story of Rudolf the Red Nosed Reindeer sponsored by General Electric. Gene Autry’s recording hit No. 1 the week of Christmas 1949. Now you know the rest of the story behind one of the most favorite Christmas songs of all. Merry Christmas and a Happy New Year!